ensuring maximum horsepower, cooler engine temperatures and long equipment life. 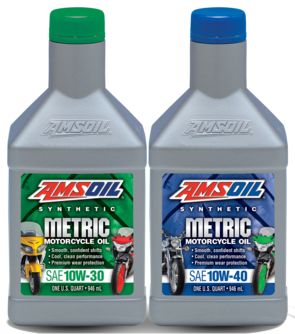 AMSOIL Synthetic Metric Motorcycle Oil’s advanced synthetic technology maximizes engine responsiveness while delivering excellent wet-clutch compatibility for smooth shifts. The high speeds and rpm at which sport bikes travel can cause oil to foam. AMSOIL Synthetic Metric Motorcycle Oil controls foam, helping you confidently push the red line for maximum speed, acceleration and cornering ability. AMSOIL Synthetic Metric Motorcycle Oil delivers smooth, confident shifts and excellent wear protection for metric cruisers. By resisting extreme heat and helping cool hot engines, it promotes peace of mind and confidence whether cruising down the highway or showing off your ride at the rally. 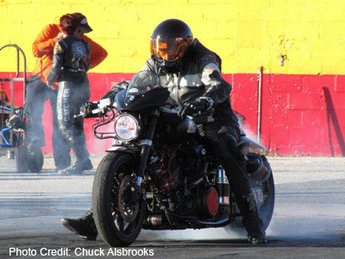 AMSOIL Synthetic Metric Motorcycle Oil helps enhance reliability by delivering superior engine protection. Its outstanding performance provides the security of knowing your bike is going to provide trouble-free operation mile after mile. It extends drain intervals to up to twice the bike manufacturer’s recommendations, allowing you to enjoy peace of mind when you’re far away from home and unable to stop for an oil change. AMSOIL Synthetic Metric Motorcycle Oil’s wet-clutch compatibility enables smooth shifts for a comfortable ride.